This teaching room is beautifully crafted and has been used for a wide variety of teaching for 20 years. It has a wooden parquet floor and a pot belly stove to keep away winter chills. 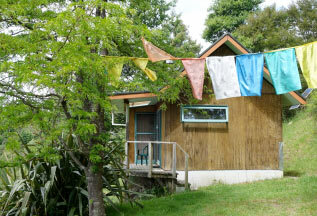 Set amongst beautiful mature trees it is has a charming view looking down the Wangapeka valley. There are eight single rooms in the accommodation block that is adjacent to the main hall. The rooms are compact and have a comfortable single bed and electric heating. New Zealand’s first pagoda (stupa) was built here in 1981 by the Burmese monk U Thila Wunta. He modelled it after the famous Shwedagon Pagoda in Rangoon (Yangon). It is beautifully maintained and the Burmese community in Nelson donated the tile work surrounding it. This, the original building at Wangapeka has the combined dining room, library and wood burner. Attached are the kitchen, bathroom facilities and laundry. Yes it has an octagonal shape. This purpose built wooden structure has big windows and carpeted floor. It is used for teaching smaller groups, bodywork and meditating as well. It is a handy distance away from the main hall. Please contact us for more details about our facilities.